The well-dressed cowboy and cowgirl stands out in a crowd. When it is time to update or add to your wardrobe you can count on Country Square Western Wear. Country Square Western Wear offers high-quality cowgirl boots and cowboy boots to SeaTac, WA residents. Having the right pair of cowboy boots is essential for proper footing no matter where you might be. Ill-fitting or loose boots will make you trip. You can rely on us for the best quality cowboy boots in SeaTac as we have a wide selection of western wear and accessories. We have cowboy boots, western boots and cowgirl boots from the best-known brands such as Justin, Corral, Ariat and more. You simply have to let our experienced salespersons know your requirement and we will help you find the right cowgirl boot. Knowing our inventory and having experience, they will help you pick the right pair of boots and accessories per your requirement. When it is about the largest selection of western boots in SeaTac, you need not look elsewhere. 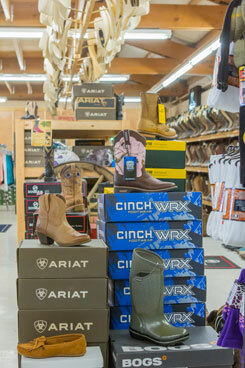 We have the largest collection of the western boots and other accessories around. Not only do we have the best collection of western boots, but we also provide the best quality boots at the most affordable prices. With us as your company for western wear and other accessories, you will find what you want at the price you want. Contact Country Square Western Wear at 253-220-7674 for any and all your cowgirl boot or cowboy boot needs in SeaTac.